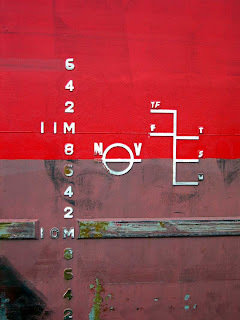 Some shipping trivia on plimsoll lines? Firstly what is the plimsoll line? It is the horizontal line and marks that you may have seen painted around the hull of the ship near the waterline. It dates back as far as 2500BC in Crete! Why is it there? It is effectively the safe load line calculated for the ship. As more cargo is loaded on board the weight forces the hull of the vessel deeper underwater. The plimsoll line is therefore effectively the maximum point a vessel may be loaded too to ensure a safe level of buoyancy is maintained for it's voyage. If the plimsoll line can't be seen as it is underwater...then you have an overloaded ship. There are more than one mark on ships as the depth a hull will float in water will vary depending on a range of factors such as salinity and water temperature. The plimsoll line tells the master of the vessel and the vessel underwriters make sure that the ship is operating within safe working limits for seas it will sail through. In fact it is not allowed to sail if the plimsoll line is not visible. This is why it is so important to have the most accurate cargo weights possible so that the ships planners can keep the vessel inside it's safe working limits and also trim the vessel so it floats evenly in the water. More on the plimsoll line. If there is any other shipping trivia or questions you have, then drop me a note in the comments field and I'll come back to you. Thanks!